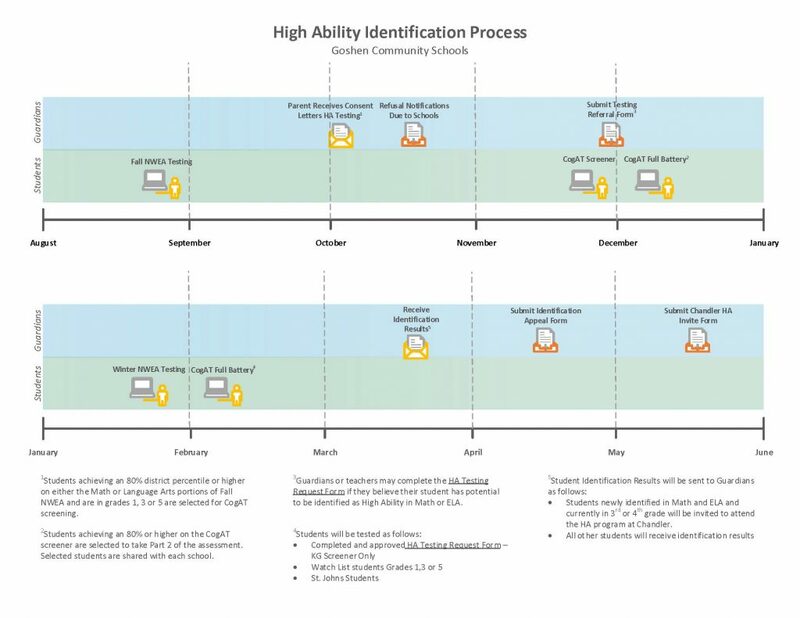 Goshen Community Schools identification process begins in Kindergarten and continues through 5th Grade. There are different assessments done throughout the year per grade. Below is a monthly timeline showing what assessments are given per grade. Goshen Community Schools identifies High Ability learners through the use of multiple layers of data sources. Mid-November: Students scoring in the 80th percentile or better on the Fall NWEA are given the opportunity to participate in the CogAT screener in grades 1, 3, 5 and 7. First Friday in December: All parent and school requests for testing are due. Paper work must be submitted to school counselor prior to consideration for testing. Form can be found here. Mid-December: Part two of the CogAT test is administered to those who have scored at or above the 80th percentile on the CogAT screener. Early February: Administration of CogAT testing for school and parent requests. Early February: Kindergarten students (selected based on January NWEA) are offered the opportunity to take screener. April: Parents will be notified of identification results. April: Appeals process intiated with completion by May.